I have been intrigued by the whiteboard activities I have seen on social media, especially #miss5thswhiteboard on Instagram. 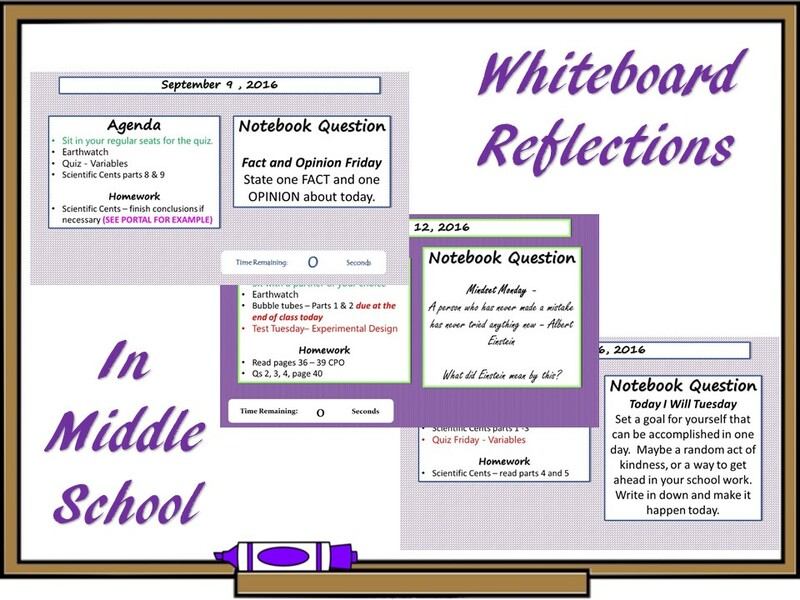 Most of the whiteboard activities pose a question and students answer the question on the board with markers or sticky notes. I teach middle school and have relatively short class periods (45 minutes a day), so the time it would take to have a class of students write is a little more than I want to give up. Plus, I only have one whiteboard for instruction and it is used everyday, so I don't have a place to set up a message and leave it for all classes. Although, I love that idea and I may try it with some unused wall space in the corner of my room. What I have decided to do is incorporate the whiteboard messages with my daily notebook question procedure. I have described my start-of-class procedure before, but in the proverbial nutshell, my students come into the classroom and check for the daily Notebook Question. This is my version of a bell-ringer, warm-up, do-now, science starter, whatever you call it. Kids have two minutes to answer in their notebooks while I take attendance and stuff like that. The question is usually a review of material from the last week or so. Quick and easy to answer. At the end of the two minutes, I show a possible answer and we take a minute or two to discuss it. Kids can change or add to their answers as necessary. The whole thing takes less than 5 minutes. 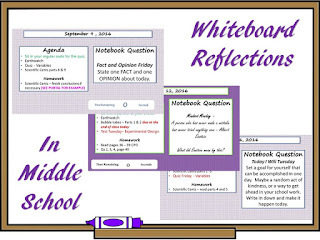 I have decided to include a whiteboard reflection-type question every now and them. I did two this week, and have one planned for next week. I doubt I will do more than one a week, and some weeks I won't do any. I have some ideas for making the questions more science-centric, and I will post those as they are more developed. At this point, I have used questions others have created. The students have had a positive response to the ones I used this week, and were eager to share their thoughts with classmates. Like my typical review questions, we didn't spend lots of time on this, but it was very effective. I'm very pleased with how it is working.